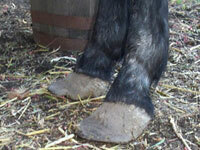 Domestication, in most instances, greatly impacts a horse’s natural lifestyle. Horses were born to live in social groups, moving up to twenty miles a day over harsh and varied terrain and feeding constantly on the sparse dry forage of their environment. 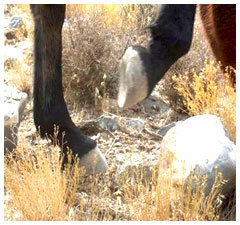 These dynamics support an overall healthy horse and develop and maintain the sturdy and sound “wild hoof” we strive for. 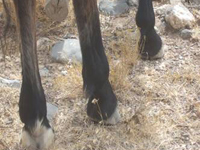 Note, no studies of wild horses have documented finding contracted heels, flaring, founder, navicular syndrome, thrush, wall cracks, white line disease and most other hoof disorders that are common in our domestic horses. 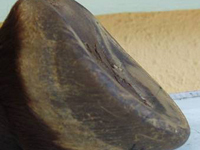 Overall, a healthy and natural hoof form exhibits a strong and calloused sole, relatively low heels with bars gradually descending towards a wide and robust frog, strong digital cushion development and a relatively short toe length with a thick rolled hoof wall (“mustang roll”). All of these components work together to bear a horses weight and withstand impact and constant contact with their terrain. 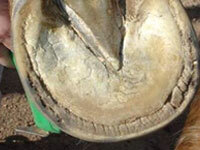 The health of a hoof is a window into the overall health of a horse. The distance between healthy and unhealthy appears to be directly related to how out of balance a horse’s mental and physical well being is. 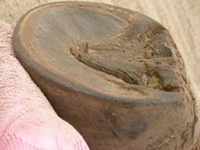 It is important to be knowledgeable and aware of what proper and healthy, versus improper and unhealthy, hoof forms are so that the latter can be addressed and corrected. Following are some examples of both. High heels negatively impact proper biomechanical movement, can force a toe first landing, weaken the lamina and eventually change the position of the internal structures (i.e. coffin bone). 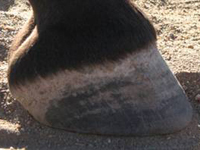 A heel is called “under run” when the horse stops walking on the bottom of the heel and begins to walk on the back of what appears to be a collapsed heel. As the heel follows and stretches towards what is typically too long of a toe, the heels become progressively weaker and are flattened by the weight of the horse. Also, under run heels throw the center of balance forward instead of straight up the middle of the leg. 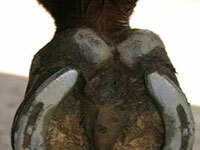 A foot with contracted heels has heel buttresses closer together than normal. 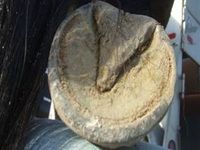 Contracted heels can be caused when the heels are not bearing their share of a horses weight due to heel pain because of thrush and/or lack of use, irregular and improper shoeing and/or trimming. 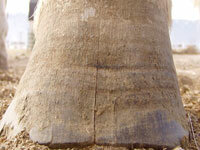 A stretched white line is a result of the lamina being pulled away from the hoof wall. 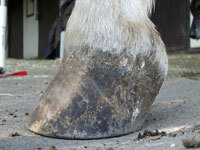 This can happen if the wall becomes too long and the weight of the horse pulls the wall away from the hoof. 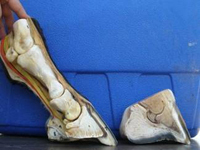 This can also be the result of a metabolic issue causing inflammation of the lamina and weakening the integrity of the lamina connecting the hoof wall to the inner structures.  Long toes put stress on the lamina causing a breakdown in the integrity. They also put unnatural stress on the tendons and ligaments as the biomechanics of proper movement are compromised.